Ira Christian is a craftsman and teacher living in Northern California. He founded the Young Artists Action League in 2015 through his love for creative expression in collaboration with the natural world and his commitment to helping young people grow into their fullest selves. After growing up immersed in the wild beauty of rural Humboldt and Mendocino counties, Ira studied political theory and fine art at the University of California Santa Cruz. He recieved his diploma in 2009 with a focus on alternative education in the 1800s. After graduating, Ira committed himself fully to his love for the natural world and his quest to find a reciprocally beneficial relationship with the earth. This led him to studies in the wilds of Utah with survival expert Matt Graham and to participating in the Four Seasons Neolithic Living Project with Lynx Vilden. 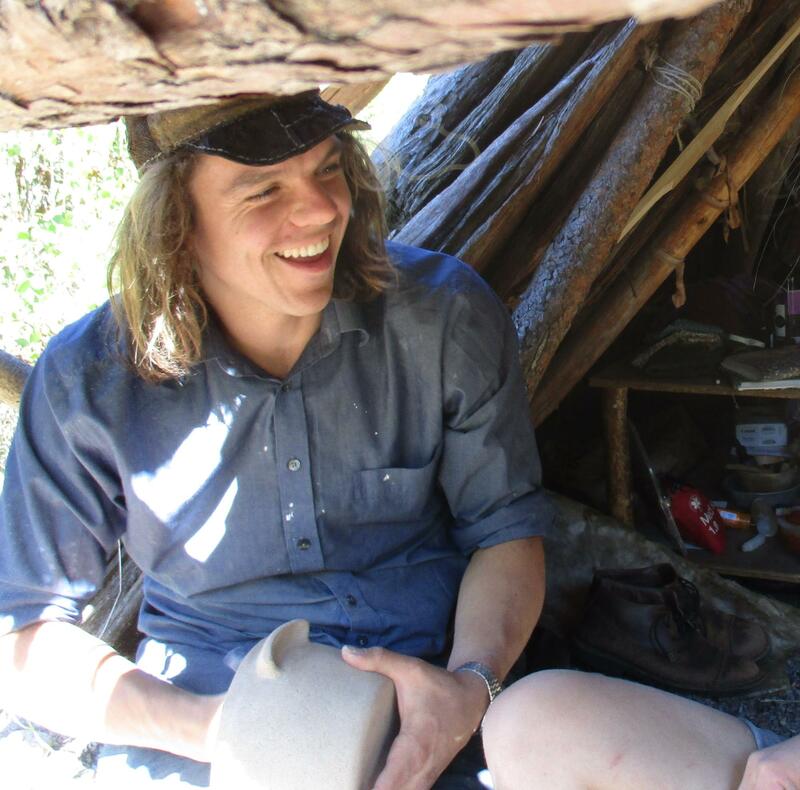 In this wilderness living intensive, Ira spent 5 months living with a group in the North Cascades of Washington state harvesting wild foods and using stone, bone, hide, wood, and antler to prepare all the tools, clothing, and equipment to live in the wild for one month. Preparations complete, Ira and the rest of the group spent three and half weeks living stone age style in the Idaho Rockies. This process can be seen in the documentary film Living Wild by French filmmaker Eric Valli. Ira has gone on to study extensively with Jon Young and the 8 Shields Institute, as well as Tim Corcoran and Headwaters Outdoor School. In addition to his love for earth living skills, Ira has consistently sought opportunities to expand his capacity with creative arts and expression. He has participated in numerous Theater of the Oppressed trainings, including an immersive apprenticeship in Belfast, Northern Ireland with theater artist Hector Aristizabal using theater as a tool for peacemaking and community dialogue between communities torn apart by centuries-old sectarian conflict. In 2012 Ira completed a summer long apprenticeship in art, music, and puppetry with the legendary Bread and Puppet Theater in Glover, VT. Ira is a student of the Creative Community model of the Partnership for Youth Empowerment. In 2014 Ira combined his love for music and craft by studying with illustrious banjo maker Lee Myslewiec in Bloomington, IN. Ira is currently a student of Bolad's Kitchen, a school of world history and cultural arts created by Martín Prechtel. Ira has led community singing, theater activities, cooking classes and storytelling events at festivals, gatherings, schools and workshops from the Orkney Islands of northern Scotland to the Driftless bioregion of northeastern Iowa. He is excited and grateful to be able to share these gifts and experiences with young people throughout California. “My time with Ira has proven to be very beneficial to my life in so many ways. He has not only been a huge part in my nature connection journey, but he has also opened my eyes to what healthy mentoring truly is. He is one of my biggest role models and I guarantee you that there will never be a dull moment when you are with him. He is a great musician, he is very creative, and he is an inspiration to all whom he comes in contact with. "Ira is a mentor with high integrity & beautiful leadership skills. The time my son has shared with him in the last two years has had a beautiful impact, deepening my son's nature connection, creativity & focus on gratitude. Ira's beautiful presence, passion for nature, music & art as well as his enthusiasm for life with its "simple pleasures" is inspiring. Children as well as adults can benefit tremendously from spending time with him. We recommend him highly!" The Young Artists Action League is a loose association of people of all ages committed to a common goal of educating and empowering young people through creative arts, nature connection, and community service. We offer opportunities for varying levels of involvement, from taking our pledge as a affirmation of your commitment to this goal in your daily life to joining us in a 7-month immersive exploration of nature, expressive arts, and stewardship. At present the only staff member is founder Ira Christian, about whom more information is offered below. "My children and I love spending time with Ira in nature! He's warm, knowledgeable and highly skilled. Plus he radiates contagious enthusiasm and curiosity." "I am so grateful for Ira's presence in my son's life. He has modeled integrity, intention, creativity and deep knowledge in a fun and accessible way. The blend between music, art, and nature awareness that he brings is unique and beautiful. I highly recommend Ira's program and look forward to having my son participate in it." "My four children have all had the wonderful experience of knowing Ira. My sons have been taught and mentored by Ira in various nature program settings. They consider him an amazing teacher and always look forward to being involved in classes/programs/camp outs/get togthers that Ira will be part of. As a parent I feel he has enriched our sons lives for years to come. The gifts he has passed on to them through his story telling, skills, music, and comradeship are priceless. I highly recommend anything that Ira is part of!" 1 : An association of persons or groups united by common interests or goals. 2 : An association of nations or other political entities for a common purpose.